You are here: Home / Gumby / Another Coral Tree for Gumby! Gumby, for those of you that don’t know, was a keen gardener, with very specific interests. When he came to the UK to stay the last time, it was to study horticulture, so that he could get his RHS (Royal Horticultural Society) certificate and to hone his skills with a view to establishing a nursery in Sodwana. He had finally managed to earn enough money to buy a plot of land there, and was going to build his house and have enough land over to grow his beloved plants. While he was in Truro, he became especially interested in micro-cultivation. His big love was for orchids, air plants, bromeliads and bonsai. He was still thinking about which of these would be the best to specialise in in Sodwana. Julie Tripp at the gardens where he worked in Truro, became a special mentor to Gumby. She responded to his passion and interests, finding that she was not just helping him with his thirst for knowledge of the plants, but also learnt much from him. He was interested in not just the plants, but also the folk lore associated with them. In South Africa, Dirk and Jean, best friends of the family, almost lifelong best friend to Gumby’s dad, had a ‘kaffirboom’ – coral tree – on their plot in Muldersdrift. A big, old, glorious tree. I collected some of the ‘lucky-beans’ from this tree, and brought them to the UK as a reminder of their shiny redness with a bold black dot. At the memorial service we had here for Gumby, his friend Julie and good mate Lee were talking to me and said they’d like to establish a garden in the park in Truro in his memory. We agreed a bee garden would be appropriate and this is now doing really well – the only ‘wild’ looking garden in the meticulously planted and tended park. 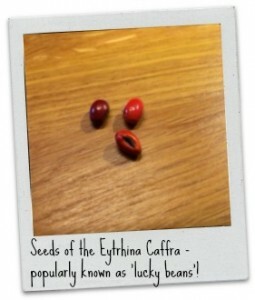 Julie said she could access a number of suitable South African plants and I gave her a ‘lucky bean’ to try and grow. 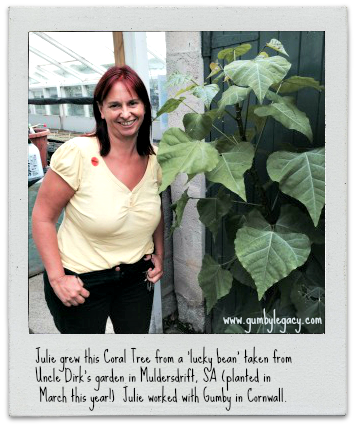 As you can see, the little seed was indeed lucky, and when I visited in September the tree was already taller than Julie! Gumby had a passion for trees, and left numerous photos he took of them, many in black and white. I have a book called Britain’s Tree Story, The history and legends of Britain’s ancient trees (Julian Hight) and am planning on visiting as many of them as I can on my travels around the UK – both to give me a reason to go places, and to celebrate my baby’s love of trees and nature. I will post pictures of these and other tress as I find them. My challenge to you, please send us photos of trees that you find pleasing! Would love one of the canopy of branches that form a tunnel over the road from Sodwana to the beach!